Time to explain the motivation for this excursion to the Morvern peninsula. A few months ago, I was exploring what Google Earth had to show for the West coast of Scotland. A lot of photographers gravitate toward the north-west, around Sutherland, and rightly so – the geography up there is impressive. However, coming a little south past Ardnamurchan, there is also epic geology – evidence of volcanoes, beautiful mountains, the works. 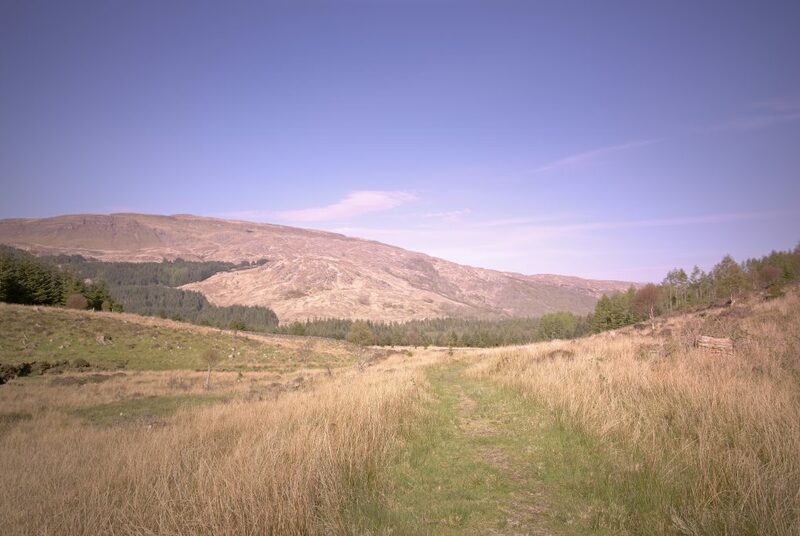 And so I stumbled across this glen past Loch Arienas and Loch Doire nam Mart, thinking there might be a view to enjoy part-way along the glen up one of the mountains to the left, perhaps. On a little research, I saw the OS map of the area showed Aoineadh Mor, a former township dissolved in the Highland Clearances. Interesting history. So I drove – about 4.5 hours from Perthshire out through Fort William around Loch Eil and down at some length on wiggly single-lane 60-limit roads – and arrived at the small roadside carpark about 4.30pm. The walk through the woods was beautiful: birches and oak trees catching the low sunlight. which shouts the beginning of the story loud and clear: a township left to ruin, increasingly taken over by nature. From what I gather, up to the 18th Century, Aoineadh Mor [approximately pronounced, and sometimes spelled, Inniemore, although the Gaelic ao vowel sound is inimitable in English] was a thriving crofting community on the slopes of Sithean na Raplaich where the burn (Allt Aoineadh Mor) flows down to the lochs. 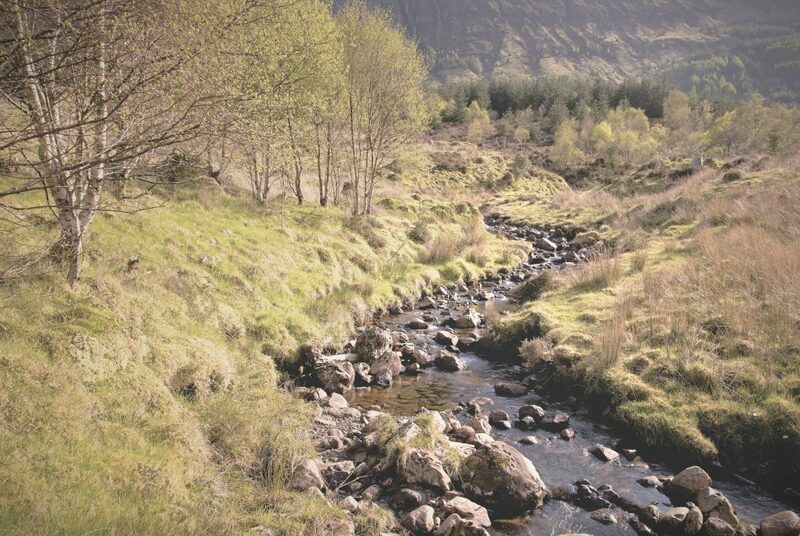 It is a wonderfully beautiful setting – the Allt Aoineadh Mor burn burbling down the hillside, through the former township of the same name. 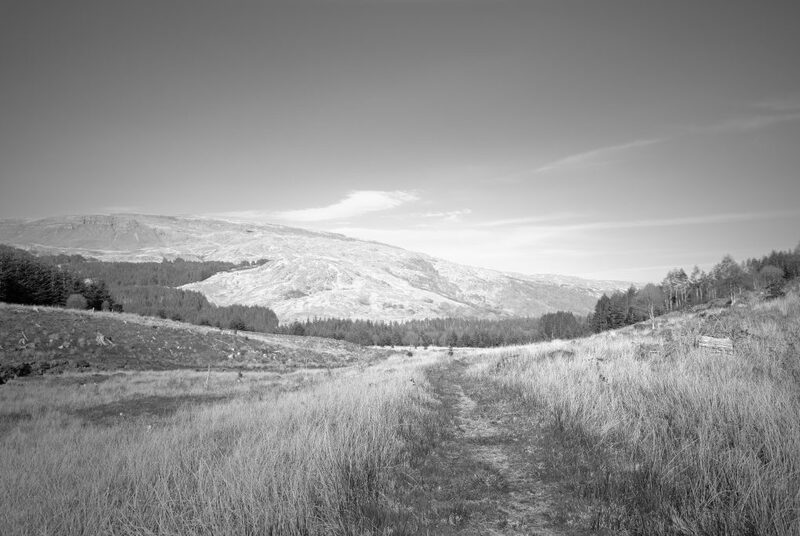 In 1824, Christina Stewart, newly owner of the Glenmorvern estate, forcibly ejected the crofters in order to farm sheep on the land for supposed greater profit, as happened in many places during the Highland Clearances. 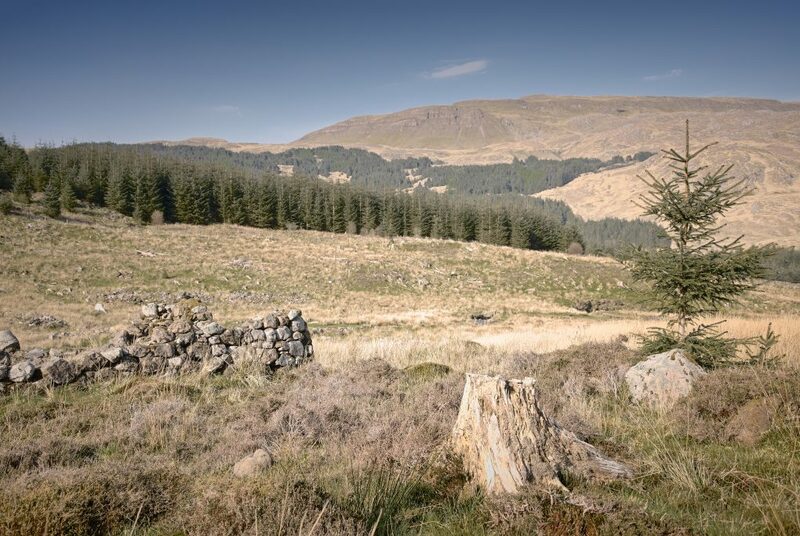 The names of two of the last crofters to leave, James and Mary, have been given to two paths through the surrounding forestry. 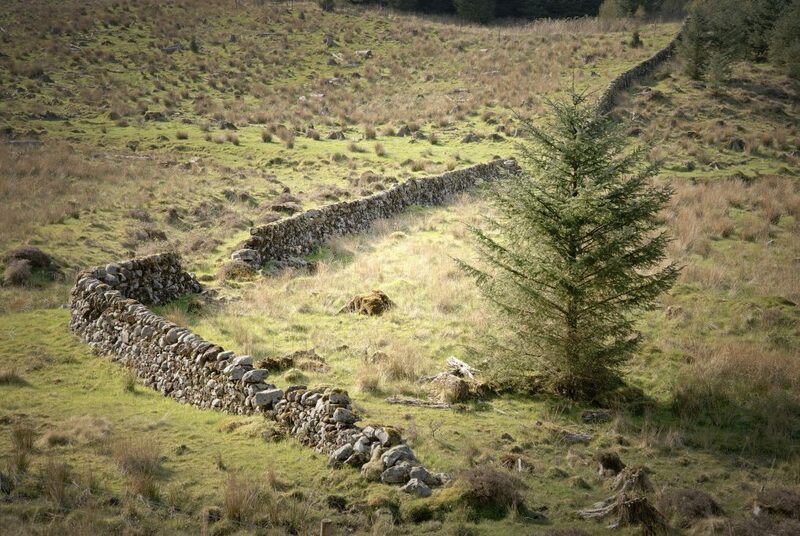 By 1930 the sheep were also no longer profitable and the area was planted with trees as the cash-crop of the time. After 60 years, in 1994, the Forestry Commission uncovered the township. And so my history intersects with the place in 2017. It is both quieting and disquieting simultaneously: quiet in that there is an open space, there are trees, light, water, all the elements of landscape we photographers like; yet disquieting in that the area is not really pure – on scratching beneath the surface, there seems to be a greater innocence in the subsistence existence of crofting, with subsequent industries of sheep farming and forestry tainted by crass desire for profit to varying extent. And so the hillside is not really wild but barren; the land not just beautiful but exploited. Dust kicked-up by a passing logging lorry travelling a path through Forestry Commission conifer woods, taken from the former township of Aoineadh Mor. 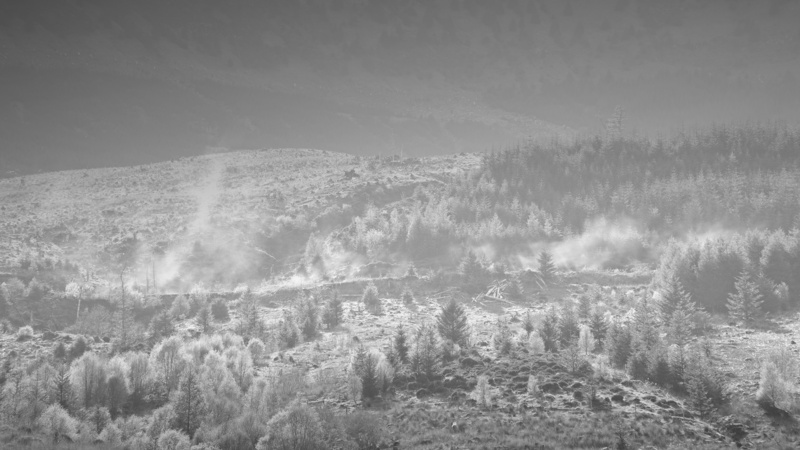 These conflicting forces of land, money and habitation are summarized in this photo, where we have nature’s pine tree felled in the foreground, a generation of mankind’s ruined croft superseded by the unnatural choice of conifers blown in as seed on the wind, leading to blue skies beyond. 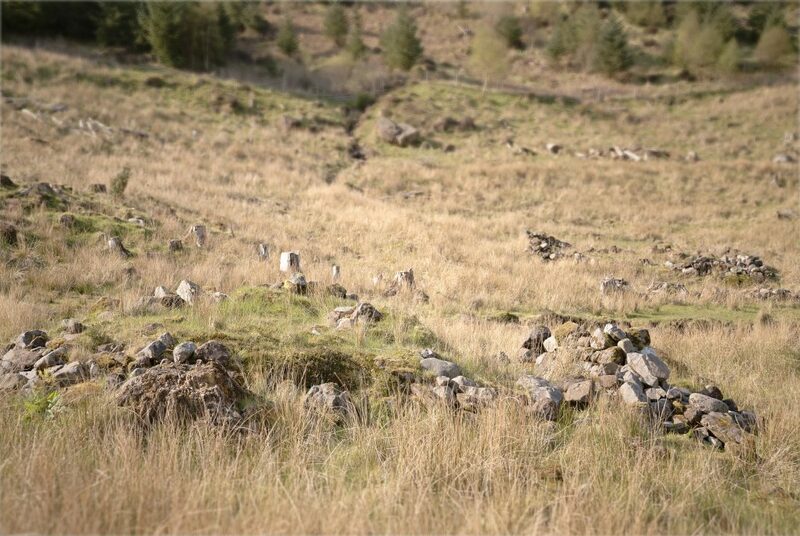 This used to be the township of Aoineadh Mor, a scattering of stone crofts on the braes beside a beautiful river surrounded by forest. 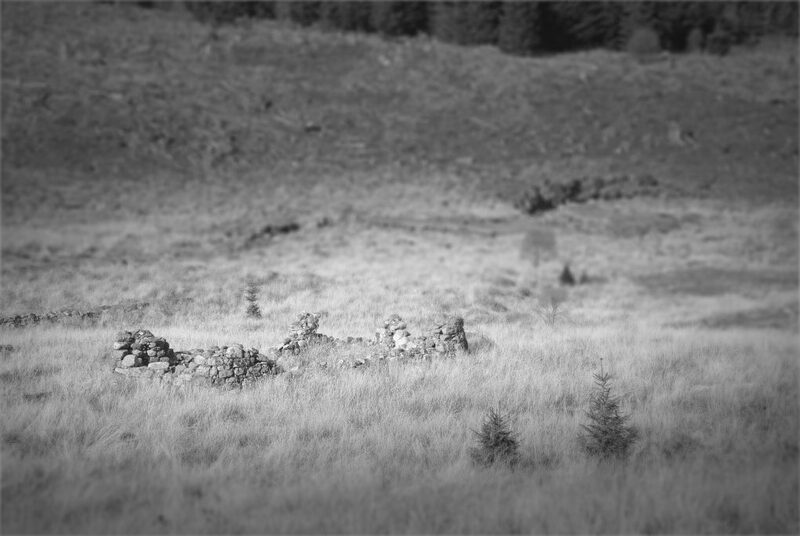 Now the Forestry Commission has taken over, with several monoculture forests on the surrounding mountains, even wild-seeding into the former township. The craggy face of Beinn na h'Uamha in the distance - from the path through Aoineadh Mor. 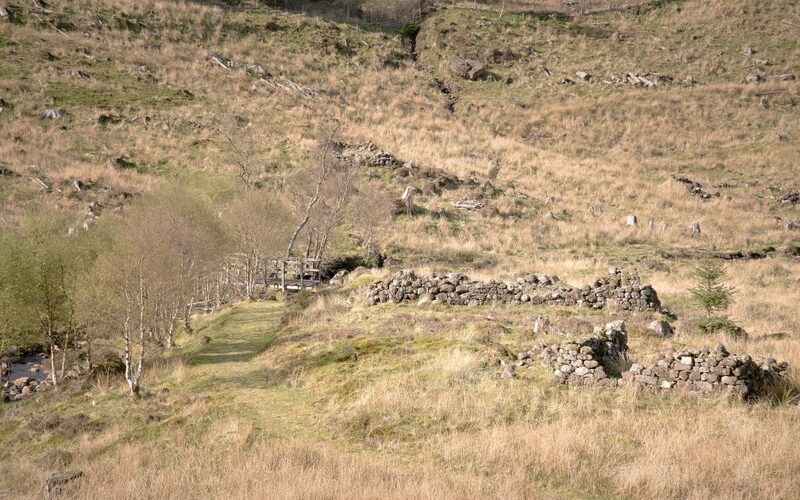 The Allt Aoineadh Mor meanders beautifully down the hillside, where once the township of the same name used to be. A beautiful place, quieting and yet disquieting simultaneously. No roof No walls No doors Wild-seeding conifers taking over the surrounding landscape No settlement. Aoineadh Mor, as was. Nothing left of the former buildings but outlines of stone walls in the grass. There used to be the township of Aoineadh Mor here; now nothing remains but the outlines of a path in the tgrass, the hills and the sun overhead. 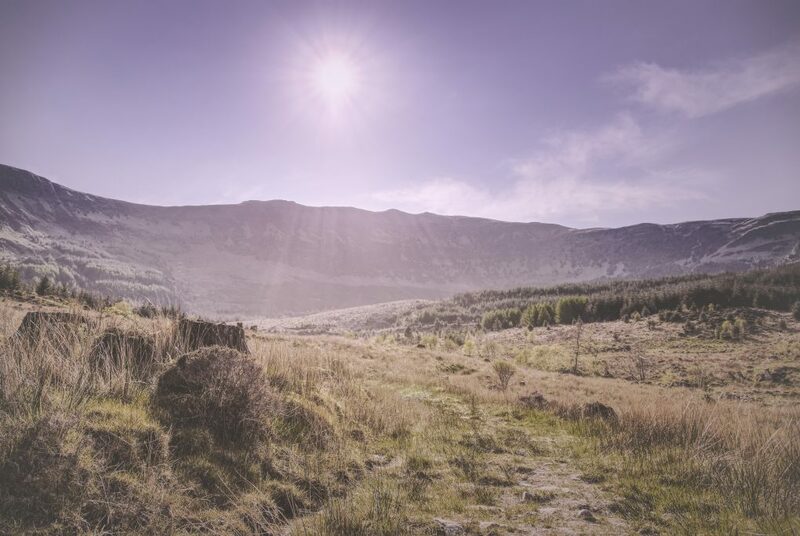 This entry was posted in Argyll, daily, Highlands, intimate-landscape, Landscape, photos, Scotland, Social Commentary, story, words and tagged Aoineadh Mor, Argyll, crofting, Inniemor, land use, photos, Scotland, story, words.